M&F Bank, a state-chartered community bank, organized in 1907 under the authority of a charter issued by the Legislature of the State of North Carolina. M&F Bank is the wholly owned subsidiary of M&F Bancorp, Inc., a one-bank holding company headquartered in Durham, NC, with assets of approximately $255 million as of March 31, 2018. The Bank serves the five largest urban markets in North Carolina: Charlotte, Durham, Greensboro, Raleigh and Winston- Salem. M&F Bank offers a full range of banking services, including the following: deposit accounts, mortgage financing, business loans, consumer loans, credit cards, SBA financing, On-line banking, mobile banking, and wealth management. In addition, the Bank provides automated teller machine (“ATM”) access to its customers for cash withdrawals through nationwide ATM networks. The Bank is also designated by the United States Department of the Treasury (the “Treasury”) as a Community Development Financial Institution (“CDFI”). A CDFI is a financial institution that provides credit and financial services to underserved markets and populations. 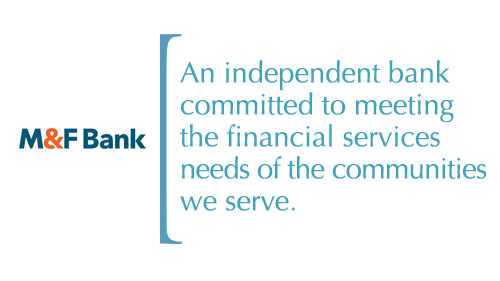 M&F Bank is the only bank in North Carolina to receive this designation. Further, Outstanding CRA Rating received from the FDIC for 20 plus years. The majority of all deposits are recycled back in the communities we serve.